Ryanair today (4 Feb) launched a new Brussels Airport route to Amman in Jordan. The route will operate twice weekly from the end of October, as part of its Winter 2018 schedule. This new Brussels Airport route will go on sale on the Ryanair.com website later this month and Belgian consumers and visitors can enjoy even lower fares and the latest “Always Getting Better” improvements including reduced checked-in bag fees, Ryanair Rooms with Travel Credit, connecting flights at Rome, Milan and Porto, and Ryanair Transfers. “We are pleased to launch this new Brussels Zaventem route to Amman in Jordan, our thirty-fourth country of operation. The route will operate twice weekly starting from the end of October, as part of our Winter 2018 schedule. 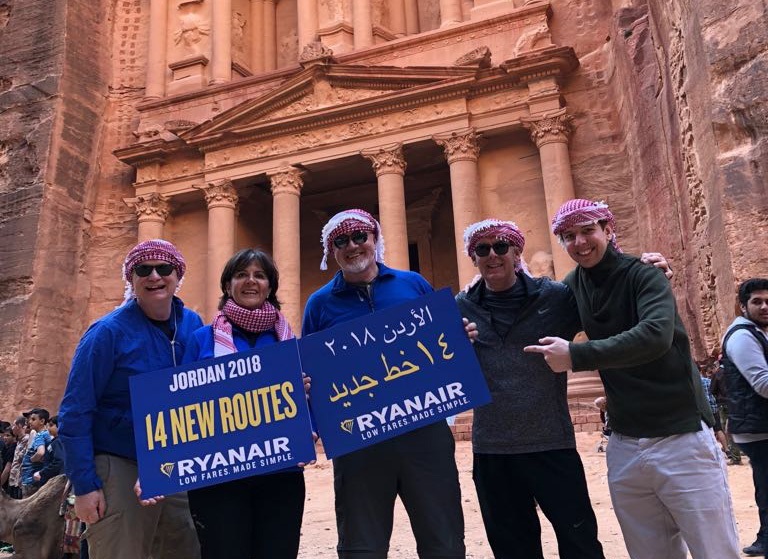 Ryanair today (4 Feb) launched its first flights to Jordan with 14 routes in total to Amman and Aqaba airports, which will deliver almost 500,000 customers p.a., as Ryanair expands its operation in the Middle East. Starting with a route to Paphos (Cyprus) in March, Ryanair’s Amman operation will grow to 10 routes from October, as part of its Winter 2018 schedule. Flights to Aqaba will commence in October with 4 routes and will operate for the winter season. “Ryanair is pleased to announce our entry into the Jordanian market from March 2018, initially with one route from Paphos in Cyprus to Amman commencing in March, and growing to 10 from October, as part of our Winter 2018 schedule. Flights to Aqaba will commence in October with 4 routes, which will deliver almost 500,000 Ryanair customers p.a. at Amman and Aqaba airports. “We are delighted to see Ryanair launch 14 new routes from Europe to Jordan. This is a significant development in Jordan’s travel industry that will offer travellers greater choice and value for money. Enhancing air connectivity is one of the key areas Jordan is focusing on given its impact on unlocking economic growth through attracting business investment as well as spurring tourism, two factors that are vital to Jordan’s economic prosperity. Ryanair’s decision to fly to Jordan sends a loud and clear message about the diversity and the untapped potential of Jordan’s tourism product. It also shows confidence in the tourism industry in Jordan, which has witnessed double-digit growth in the past year. The timing of the launch of these new flights is ideal given the increased global interest in Jordan and its recent listing as one of the best destinations to visit in 2018 by numerous world-renowned travel and tourism publications. To coincide with these new flights, we will be launching different marketing campaigns in the new source markets targeting specific types of tourists such as religious, adventure and business travellers. Ryanair has announced its 34th destination from Budapest Airport, with the introduction of a twice-weekly operation to Amman in W18/19. The 2,251-kilometre sector to the Jordanian capital city is a brand new destination for the Hungarian gateway, which offers services to Aqaba in the south of the Middle Eastern country on its Red Sea coast. With this new route addition, the capital city airport will offer 131 destinations in 119 cities from 47 countries in W18/19. The extra flights from the ultra-low-cost carrier (ULCC) in W18/19 strengthens Ryanair’s position as Budapest’s second-largest carrier, and is expected to offer in excess of 2.3 million seats from the airport this year. The new sector to Amman will join Ryanair’s existing S18 expansion plans at Budapest, which will see the addition of routes to Santander, Paphos and Marseille.